A vegetarian alternative to the traditional Italian meat-based sauce, Bolognese. 1 – Stir together dried tomatoes and 1/2 cup boiling water in a bowl; let stand 30 minutes. Drain, chop, and set aside. 2 – Sauté onion and next 5 ingredients in hot oil in a large skillet over medium-high heat 6 to 8 minutes or until vegetables are tender. Stir in chopped tomato. 3 – Stir in pasta sauce, and bring to a boil. Reduce heat; stir in basil, and simmer, stirring occasionally, 5 minutes. Serve over hot cooked pasta. For Breakfast this morning I toasted a couple of Eggo Waffles (Low Fat Nutrigrain) and had my morning cup of Bigelow Decaf Green Tea. I had ordered a Rotisserie Chicken from Kroger yesterday and after Lunch I went to pick up. Using as part of my Dinner tonight. Had a thunderstorm come through early this morning and then partly cloudy and 92 degrees out, and VERY humid. Don’t like this humidity at all. I seen the Wild Turkey again this morning in the back yard, second time I’ve seen them recently. We have the Turrkey, a couple of Deer, and assorted other critters running around. We also have somehow been adopted by a large yellow cat that now stays around the house outside. He sleeps a lot and that’s about it. For Dinner tonight its Chicken Stir -Fry w/ Baby Carrots, Cut Green Beans, Water Chestnuts, Bean Sprouts, and Mushrooms. To make the Stir – Fry I’ll need; 1 Whole Rotisserie Chicken (Kroger Deli), 1 package Hakubaku Organic Japanese Wheat Noodles, 1 can Whole Baby Carrots (drained), 1 small can Del Monte Cut Green Beans (drained), Sliced Water Chestnuts (drained), 1 can of Bean Sprouts (drained), 1 can Stir-Fry Mushrooms (drained), Chow Mein Noodles, Kikkoman Less Sodium Soy Sauce, and Extra Light Olive Oil. I went to Kroger earlier today and picked up a Whole Rotisserie Chicken. Pulled all the meat and this was my Chicken for the Stir-Fry. Next I grabbed a large nonstick skillet and sprayed it Pam Cooking Spray and added a tablespoon of Extra Light Olive Oil and heated the pan on medium heat. When heated I added my Pulled Chicken, Carrots, Green Beans, Water Chestnuts, Bean Sprouts, and Mushrooms. Stirred until mixed then added the Kikkoman Soy Sauce, you add this according to your taste. Stirred and heated everything until heated through. Removed it from the heat and covered it. Next I boiled my Udon Noodles. I used a large pot and filled it 1/2 way with water. Heated the water to boiling and added my Noodles. Stirring, and cooked for 4 minutes. Drained them and added them to the Stir – Fry Skillet. Stirred until mixed and served! This hit the spot for Dinner! Topped a bowl of the Sir – Fry with some Chow Mein Noodles. Had a Diet Dr. Pepper to drink. For Dessert/Snack tonight a bowl of Skinny Pop – Pop Corn along with a Diet Trop A Rocka Snapple. I have a Slow-Cooker Veggie Chili to go along with the Soup Recipe I posted. Another good one to drive away the Winter blues! It’s got a nice variety of vegetables and spices in it. You can add your favorite Hot Sauce to kick it up a notch. Enjoy and Eat Healthy! ** As all Chili, Soup and Stew recipes; make it a day ahead of time and sit it in the fridge overnight. It’s always better the 2nd day. 1. Sauté first 3 ingredients in a large nonstick skillet coated with cooking spray over medium-high heat 10 minutes or until onions are translucent. Add mushrooms, zucchini, and squash; sauté 3 more minutes. Add chili powder, cumin, and next 2 ingredients, and sauté 5 more minutes. 2. Stir together tomato sauce and tomato juice in a 6-qt. slow cooker until smooth. Stir in diced tomatoes, next 2 ingredients, and carrot mixture. Cover and cook on LOW 8 hours. For Breakfast on this second day of 2017 I’m having a toasted Healthy Life Whole Grain English Muffin, topped with Smucker’s Sugar-free Blackberry Jam, and as every morning, a cup of Bigelow Decaf Green Tea. After Breakfast and the morning workout I headed off to Meijer. They had several sale items that we use so I went to cash in on them and I also needed to pick up a couple of packages of Jennie – O Extra Lean Ground Turkey Breast, I’m making some 3 Bean Turkey Chili sometime this week. Not a bad at all out here today, cloudy but 54 degrees! Back home I did some light cleaning around the house. For Dinner tonight its Seasoned Gulf Coast Grouper, Baked Clam Strips, and Harvest Vegetables. I love Fish and Seafood, especially this Florida Gulf Coast Grouper my friends keep bringing me back up from Florida! I had a fillet of it in the freezer, laid it in the fridge overnight to thaw. To prepare the fillets I seasoned them with just a bit of Sea Salt and put the fillets in a Hefty Zip Plastic Bag where I then added the Zatarain’s Seafood Breading Mix Seasoning. Shook until the fillets were well coated. Shook off the excess. Then got the Cast Iron Skillet out, sprayed it with a light coat of Pam Cooking Spray and added a tablespoon of Light Olive Oil. Heated the skillet on medium heat. When the skillet was ready I added the Grouper Fillets, frying about 3 minutes per side until golden brown. Grouper is so meaty and flavorful. Love Fish, Love Seafood! I used a box of SeaPak Clam Strips. Preheat the oven on 400 degrees. I then lined a baking sheet with foil and sprayed it with a shot of Pam Cooking Spray. Placed the Clam Strips in a single layer on the sheet and baked them for 12 minutes, flipping them over after 7 minutes. These come out so delicious. Love these, very meaty strips, well seasoned, and easy to prepare. Had a side of McCormick’s Tarter Sauce, for dipping. Then for a side I prepared a package of Pict’sweet Harvest Vegetables with Roasted Red Potatoes and Herb and Garlic Seasoning. Another item that’s easy to prepare. Just microwave them in their steamable bag they come in on high for 5 minutes an d you have some steaming hot delicious vegetables. Pict’sweet has several different vegetable products but this is my favorite. It contains sugar snap peas, carrots and robust roasted red potatoes in a garlic seasoning. Grouper – Firm texture, white meat with large flake and a mild flavor. Extra lean fish. The rustle of leaves, chilly evenings and a good walk in the woods. It’s harvest time, and we’ve brought together sugar snap peas, carrots and robust roasted red potatoes – great vegetables of early fall to steam up for a burst of real stick-to-the-ribs flavor. Gently shake bag side to side to evenly distribute contents. Place ONE frozen, unopened bag THIS SIDE UP in microwave. Microwave on HIGH for recommended cooking time. Let stand 1 minute. CAUTION bag will be hot. Carefully remove bag from microwave. Cut open package, pour, stir and enjoy! Open package and pour frozen contents and ¼ cup water into a saucepan. Boil for 3 minutes. Reduce heat and simmer 3 minutes, stirring occasionally. Add additional water if needed. Here’s a Mushroom Veggie Burger to go with those Spicy Baked Sweet Potato Fries! 1 – Heat 2 tablespoons olive oil in a large skillet over medium heat; add mushrooms, onion, and garlic to the hot oil and season with salt, black pepper,oregano, thyme, and nutmeg. Cook and stir mushroom mixture until mushrooms have given up their juice and the juice has almost evaporated, about 10 minutes. Transfer cooked mushrooms to a cutting board and chop into small chunks with a knife. 2 – Transfer mushrooms to a large bowl. Mix in rolled oats and bread crumbs; taste for salt and black pepper and add more to taste. Stir Parmigiano-Reggiano cheese into the mixture, followed by eggs. Let mixture stand for the crumbs to soak up excess liquid, about 15 minutes. (At this point you can refrigerate the mixture to cook later if desired.) Moisten hands with a little vegetable oil or water, pick up about 1/4 cup of mixture, and form into burgers. 3 – Heat remaining 2 tablespoons olive oil in a skillet over medium heat and pan-fry burgers until browned and cooked through, 5 to 6 minutes. Started my day with a light Breakfast of a toasted Healthy Life Whole Grain English Muffin topped with I Can’t Believe It’s Not Butter. Also my morning cup of Bigelow Decaf Green Tea. After that I went to Kroger for Mom, just needed a fe items. Back home helped Mom with some laundry and got the leaf blower out to blow out a lot of leaves and small limbs. They are tearing down the woods behind us and it’s giving us a mess to clean up! 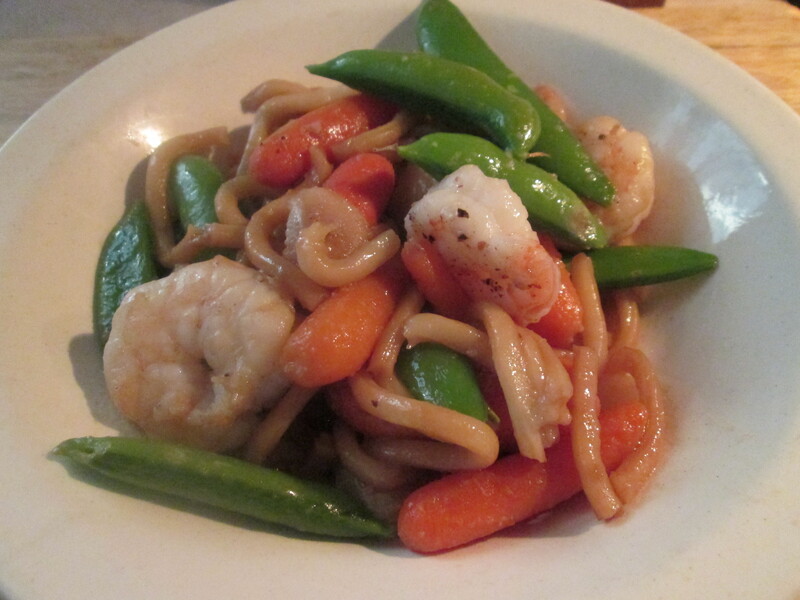 Anyway for dinner tonight I prepared a Stir – Fry Shrimp with Udon Noodles. I had been wanting some Stir-Fry for a while now and today just felt like the day to have it! To make this dish I’ll need; 1 – 7oz. pouch Udon Noodles (KA*ME Udon Stir Fry Noodles), 1 lb. bag of Large Shrimp, Asparagus, Baby Carrots, Sugar Snap Peas, LaChoy Sliced Water Chestnuts, 1 tsp minced Garlic, 1 tbsp butter (Blue Bonnet Light Stick Butter), 1 tsp sugar (Splenda Sugar), and Light Soy Sauce (Kikkoman Reduced Sodium Soy Sauce). To prepare it, I started by preparing the Baby Carrots. I boiled them in a small sauce pan, boiling them until they were not quite fork tender. I parboiled them because Carrots take a bit to cook and by boiling them first they will get done in the wok with the other ingredients. As the Carrots were boiling I also prepared the Shrimp. In a bowl mix the shrimp with 1 tsp Splenda Sugar and a dash of McCormick Grinder Sea Salt and Peppercorn Medley . Marinate for 15 minutes. Next cooked them in a bit of butter just until pink. Remove Shrimp from the skillet and set aside along with Baby Carrots. In a separate skillet I prepared the Udon Noodles. Using a medium size skillet, I added 1/2 Tbsp. of Extra Virgin Olive Oil and heated on medium high. I added the Noodles and the Soy Sauce, stirred and cooked for 2 minutes. Removed from the heat and set aside. Using the same skillet as the Shrimp was cooked I added a tablespoon of Extra Virgin Olive Oil (cooking on medium high) along with the Butter, Asparagus, Baby Carrots, Sugar Snap Peas, Water Chestnuts and 1 tsp minced Garlic. Then seasoned them with the Sea Salt and the Peppercorn Medley. Cooked it 2 minutes and then added 2 tablespoons of water and the cooked Carrots, Shrimp, and Noodles. Continued to cook everything for an additional 1 1/2 minutes, stirring it often. Remove from heat and serve! Love this dish, everything spot on! 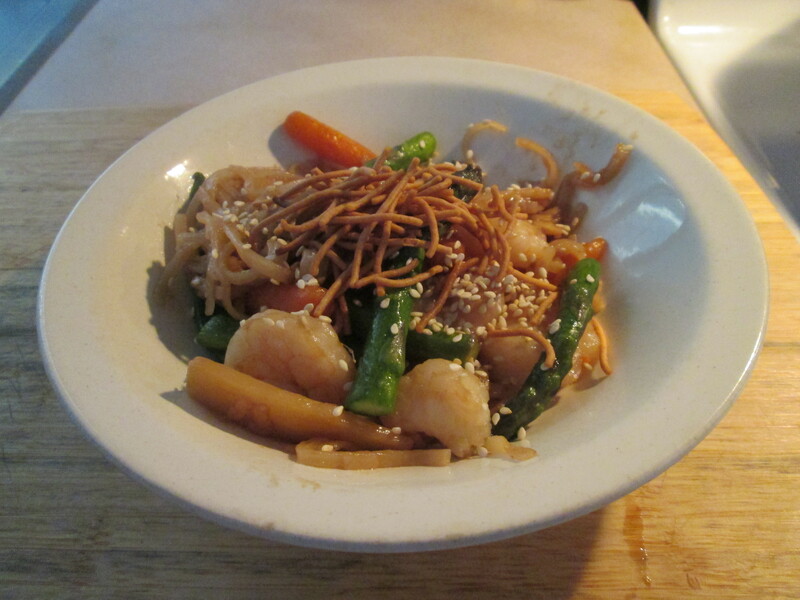 The Noodles, Shrimp, Vegetables, along with the seasoning and Soy Sauce combine to make one delicious dish. 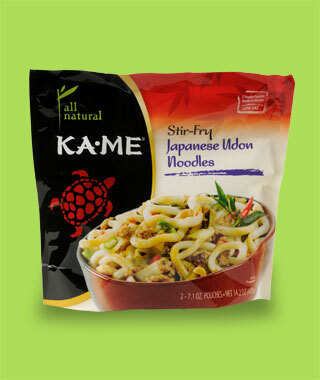 Really like the KA*ME Udon Stir Fry Noodles, they taste so fresh! For dessert/snack later some Tostitos Multi Grain Scoops and Newman’s Own Black Bean and Corn Salsa. Udon noodles are thick, white Japanese noodles. They can be eaten cold or hot. Udon noodles are often served in a mild fish broth, flavored with soy sauce and mirin (sweetened sake) and topped with thinly sliced scallions. KA-ME Stir-Fry noodles are easy to prepare: Heat 1 tbsp KA-ME Sesame Oil in a wok; add thinly sliced vegetables and stir-fry for 2 minutes. 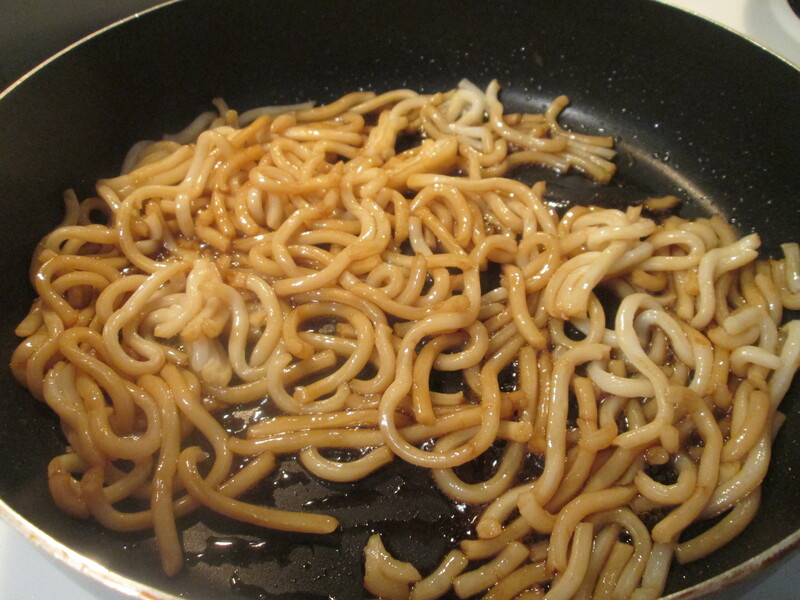 Add KA-ME Udon noodles, 1 tbsp KA-ME Soy Sauce, 1 tbp sugar and cook for 3 minutes, stirring constantly. INGREDIENTS: WATER, WHEAT FLOUR, TAPIOCA STARCH, SALT ENZYME, ACIDITY REGULATORS (ACETIC AND LACTIC ACID, GLUCONO DELTA-LACTONE, SODIUM MALATE AND SOLIUM LACTATE). Here’s a handy guide for all the Fall Fruits and Vegetables Harvest that’s coming in now. It’s from the about.com website. You can see the entire article by clicking the link at the bottom of the page. What’s in Season in Fall? Look for these fall fruits and vegetables at farmers markets and in produce departments for the best flavor (and greatest value) in season. Apples are one of those fruits people have forgotten have a season. But they do, and in the Northern Hemisphere they’re harvested late summer through fall. Artichokes produce a second, smaller crop in the fall (the first go-around is in the spring) that tends to produce small to medium artichokes. Belgian Endive are mostly “forced” to grow in artificial conditions. Their traditional season (when grown in fields and covered with sand to keep out the light), like that of all chicories, is late fall and winter. Broccoli can be grown year-round in temperate climates so we’ve forgotten it even has a season. It is more sweet, less bitter and sharp when harvested in the cooler temperatures of fall in most climates………. Started the day off with a Breakfast Sandwich. I scrambled some Egg Beater’s Egg Whites, fried some Bologna, topped with a slice of Sargento Ultra Thin Sharp Cheddar Cheese. Then on to the morning workout and a shower. Dad had a Doctor’s appointment for a checkup. So while him and Mom were out I vacuumed and dusted the house. Then outside got the leaf blower out and swept around the driveway and deck. The tree in front of the house has already lost most of it’s leaves, and they are everywhere so it’s a daily sweeping outside. Got everything done and kicked back for the late afternoon! For dinner tonight it’s Shrimp with Udon Noodles. So to make this dish I needed; 1 – 7oz. pouch Udon Noodles (KA*ME Udon Stir Fry Noodles), 1 lb. 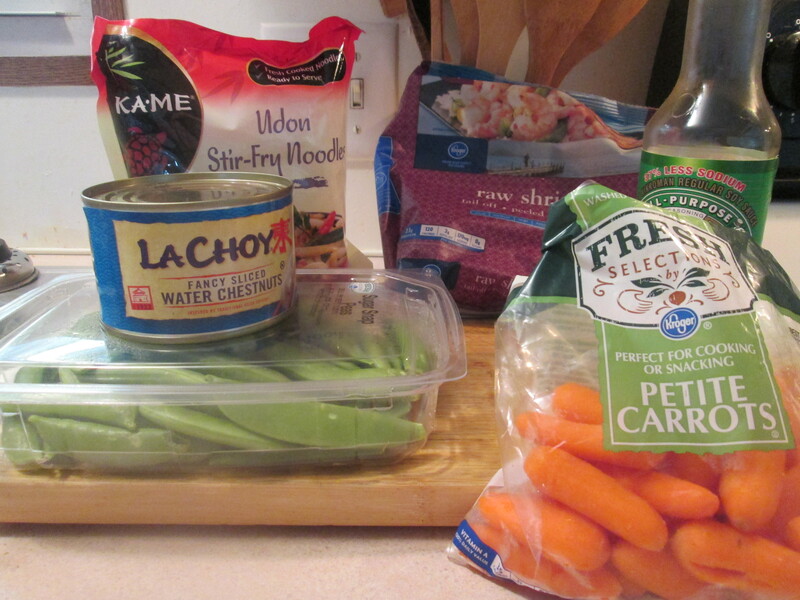 bag of Jumbo Shrimp, Baby Carrots, Sugar Snap Peas, 1 Can LaChoy Sliced Water Chestnuts, 1 tsp minced Garlic, 2 tbsp butter (Blue Bonnet Light Stick Butter), 1 tsp sugar (Splenda Sugar), and Light Soy Sauce (Kikkoman Reduced Sodium Soy Sauce). To prepare it, I started by preparing the Baby Carrots. I wanted to boil them in a small sauce pan, boiling them until they were not quite fork tender. I parboiled them because Carrots take a bit to cook and by boiling them first they will get done in the wok with the other ingredients. As the Carrots were boiling I also prepared the Shrimp. 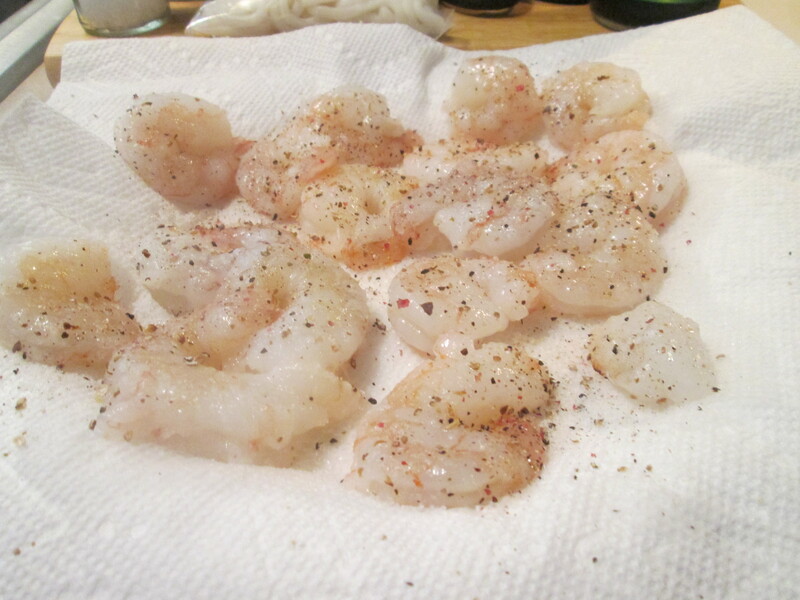 In a bowl mix the shrimp with 1 tsp Splenda Sugar and a dash of McCormick Grinder Sea Salt and Peppercorn Medley . Marinate for 15 minutes. Next cooked them in a bit of butter just until pink. Remove Shrimp from the skillet and set aside along with Baby Carrots. Using the same skillet as the Shrimp was cooked I added a tablespoon of Extra Virgin Olive Oil (cooking on medium high) along with the Butter, Baby Carrots, Sugar Snap Peas, and 1 tsp minced Garlic. Then seasoned them with the Sea Salt and the Peppercorn Medley. Cooked it 2 minutes and then added 2 tablespoons of water and the cooked Carrots, Shrimp, and Noodles. Continued to cook everything for an additional 1 1/2 minutes, stirring it often. Remove from heat and serve! What a dish, everything spot on! 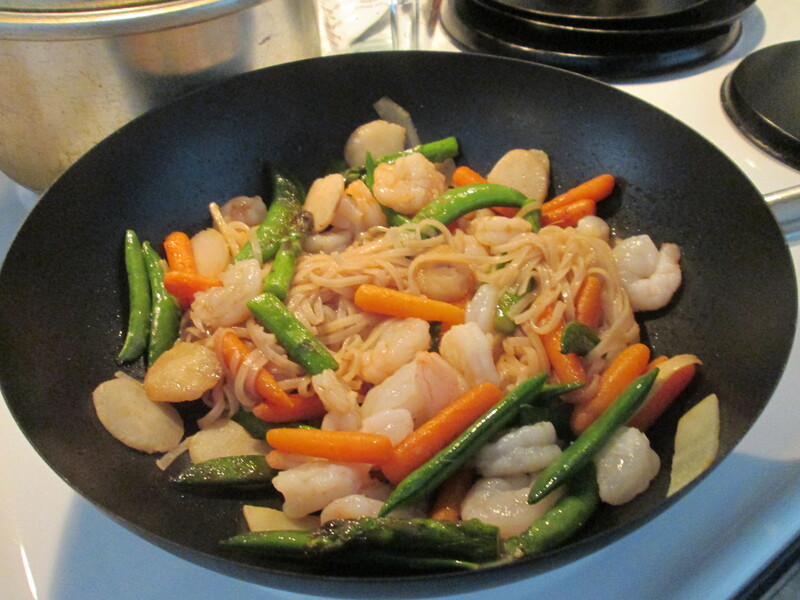 The Noodles, Shrimp, Vegetables, along with the seasoning and Soy Sauce combine to make one delicious dish. Really like the KA*ME Udon Stir Fry Noodles, they taste so fresh! For dessert/snack later Chips and Dip, some Ruffle’s Reduced Fat Potato Chips and Lay’s Ranch Dressing. Started off in the 30’s this morning. But a lot of sunshine again and in the 60’s. Hopefully no rain for a while, they started sanding down our wooden deck, doing some light repair to it, and hopefully get it painted. One of three outside projects that have to be done. Mom needed some items from Kroger so I went to the store for her, stopped by the post office and sent some letters out for her, and then I stopped by the bank before coming home. 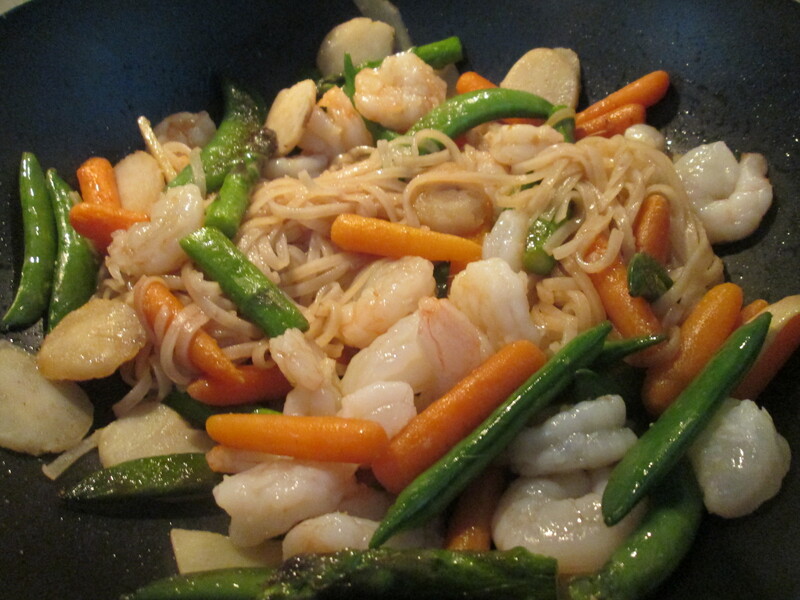 For dinner tonight Shrimp and Vegetable Stir-Fry. Had the Shrimp in the freezer and laid them in the fridge to thaw overnight. I had not prepared or had Stir-Fry in a very long time, in fact way too long! So I decided last night that was going to be dinner tonight! I laid a bag of Kroger Brand Medium Shrimp (1 lb. Bag) in the fridge overnight to thaw. When I was at Kroger earlier I picked up the remaining ingredients I needed. Along with the Shrimp I’ll need; 1 can Reese Sliced Water Chestnuts, 1 can Reese Fancy Sliced Bamboo Shoots, Baby Carrots, Sugar Snap Peas, Asparagus (trimmed and cut diagonally into 2-inch pieces), Thai Kitchen Brown Rice Noodles, Low Sodium Soy Sauce (To Taste), 1 tablespoon peeled and grated fresh Ginger, 1 tablespoon Toasted Sesame Seeds, and a pinch or two of Splenda Brown Sugar. In a small bowl, stir together the Soy Sauce and Ginger. Set aside. To start I preboiled the Baby Carrots about 7 minutes, drained and set aside. Carrots can take a while to soften so I boil them first to help the cooking process. Then I also boiled my Noodles by package instructions, drained and set them aside. To prepare the dish, in a Wok on med. high I added the 1 Tbsp Extra Virgin Olive Oil. I then added the Asparagus, Bamboo Shoots, Water Chestnuts, Sugar Snap Peas, and Baby Carrots to the Wok, and cook until tender-crisp stirring frequently (about 5 minutes). 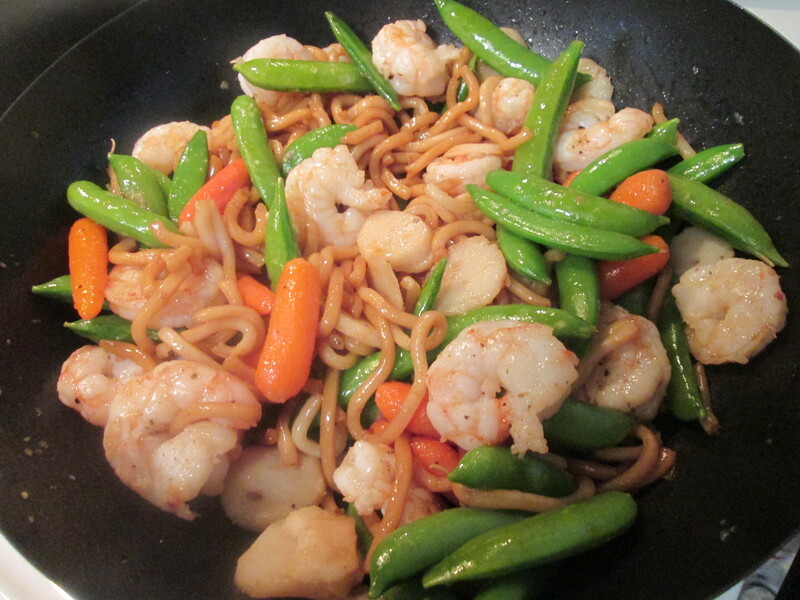 Stir in the Noodles, Soy Sauce Mixture, Brown Sugar, and Shrimp. Continue cooking for 1-2 minutes until all the ingredients are heated through. Serve and top with the Toasted Sesame Seeds and La Choy Rice Noodles. What a dish! The Shrimp along with the Vegetables and Seasoning is just a perfect meal. Makes me wonder why I always wait so long to prepare this. For dessert later a bowl of SO Delicious Soy Milk Chocolate Obsession, if you’ve never tried the So Non Dairy Products it’s time! Unique brown rice noodles get their warm color from naturally brown rice. Their mild flavor and tender texture make them versatile for all types of dishes from noodle stir-fries and steaming bowls of rice noodle soups to cold noodle salads. Each package contains four individually wrapped single-serve noodle nests so you can make a meal for one as easily as for the whole family. We use only the highest quality rice and traditional processing methods for our rice noodles every batch is steam-cooked and slowly dried. The result is a noodle that is made with all-natural ingredients, preservative-free. Make your kitchen a Thai Kitchen. Brown Rice, Whole Rice, Tapioca Starch, And Water. Combine autumn ingredients for a breakfast bowl of Fall granola. 1 – Preheat the oven to 300 degrees F. In a small saucepan, set over medium heat, add the coconut oil, honey, brown sugar, salt, cinnamon, nutmeg and cardamom; mix until melted and combined. 2 – To a large bowl, add the rolled oats. Next, pour the coconut oil mixture atop the oats and mix until thoroughly coated. Add the walnuts and pumpkin seeds and toss. Transfer the granola to a parchment-lined baking sheet and place in the oven to bake for 15 minutes. At the 15-minute mark, give the granola a stir and bake for an additional 5 to 10 minutes, until lightly golden brown. 3 – Allow to cool completely. When cooled, add the dried apples and raisins and toss once more. Serve with milk of choice or yogurt.